Luggage regulations for air travel vary between countries and to make matters worse, they often change with short notice in line with changes in air travel security. Furthermore, the rules can be different between destinations as countries and airlines enforce luggage rules of their own. The luggage requirements tend to be stricter for international flights than domestic flights. In this article we have summarized the most common restrictions that apply, and provide you with links to further useful resources for specific restrictions. You should always check the latest luggage requirements with your airline (luggage allowance) and relevant governments for the latest airport security restrictions (prohibited items, how to pack, custom rules, etc.). Each airline decides how much luggage their passengers can bring on-board their planes. The luggage allowance can therefore vary between airlines and even for different routes and classes of the same airline. Low cost airlines tend to be stricter on luggage allowance and are more likely to enforce higher charges for overweight or additional pieces. Luggage is additional weight and even though airplanes are large pieces of equipment, each additional kg or lbs requires additional fuel to carry and thus more cost to the airline. It is therefore the airline's discretion how many pieces of luggage you can bring and how heavy and big each item can be. You can see the Carry-on and Check-in airline luggage restrictions for 25 major airlines on our sister website, Top Travel Tips. Airline luggage restrictions can change with short notice so check with your air carrier prior to leaving for the airport. Each country can restrict what items passengers can bring in their luggage (both check-in and carry-on luggage). Prohibited items usually include flammable materials, fireworks, chemicals, sharp objects, weapons, liquids, sprays, etc. In most developed countries, airport security staff will screen, and in some cases, inspect your check-in luggage after you handed it over to your airline. This is done in order to identify any prohibited items and stop them being loaded onto your plane. Airport security staff have the authority to confiscate anything they consider dangerous, even items that are normally allowed in hand luggage. Carry on luggage regulations are stricter than the check-in regulations. For example, you can check-in most sharp objects as long as they are securely wrapped to prevent injury to baggage handlers and luggage inspectors. You should avoid packing anything that could raise airport security suspicion, but to be on the safe side, check the latest official luggage regulations prior to packing your bag. If still in doubt, then it is safest to leave the item at home. 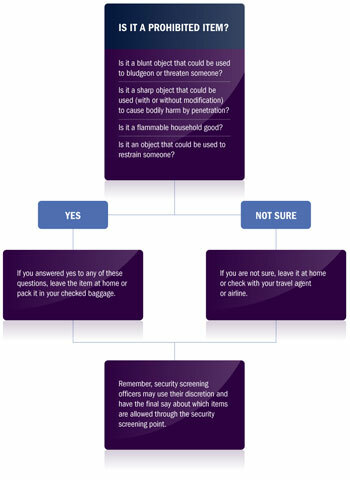 The following illustration from the Australian Government is helpful when evaluating if item is likely to be prohibited on board a plane or not. The TSA (Transportation Security Administration) tool Can I Bring It is also very useful for those travelling to and from US (including those in transit). You just type in the name of the items you want to bring with you, and they will tell if you they are permitted or not, and if you can carry the allowed items in hand luggage or pack them in your check-in luggage. Very useful feature and you can also download TSA mobile application, which is very convenient when on the move. The only safe way to find out if you can bring an item or not, is to check with the relevant official regulation resource. The following official websites offer information about prohibited items in the relevant countries.